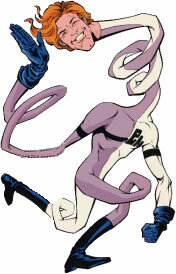 The Elongated Man is a fictional character, a comic book superhero in the DC universe. He is an off-and-on member of the Justice League, as well as many of its spin-offs. His first appearance was The Flash (vol. 2) #112 (May 12, 1960). He was partially created by Julius Scharwtz, who noted he only created the character because he didn't realize DC Comics had acquired Plastic Man in 1956. The character has won and been nominated for several awards over the years, including winning the 1961 Alley Award for Best Supporting Character. According to his origin, as a teenager, Ralph Dibny adored contortionists, or people who displayed feats of agility and suppleness. He learned that many of these body-benders drank gingold juice. Ralph set to work learning chemistry and developed a super-concentrated extract of the stuff, which gave him his stretching powers. Ralph Dibny was one of the earliest Silver Age DC heroes to reveal his secret identity to the public, and also one of the first to marry his love interest. He and his wife Sue Dibny became effectively partners, solving mysteries and participating in Justice League adventures as equals. They were also notable in having a stable, happy, and relatively trouble-free marriage — an anomaly in the soap operatic annals of comic books. Fans of the characters often referred to Ralph and Sue as the "Nick and Nora Charles of the super-hero set" (a reference to "The Thin Man" movies). In Identity Crisis #1, published in June 2004, tragedy struck these beloved, if second-tier, characters when Sue was murdered in the Dibny home just before she was going to surprise her husband with the news that she was pregnant. Ralph and Sue also appeared as members of the Justice League offshoot the Super Buddies in the miniseries Formerly Known as the Justice League and its sequel story arc "I Can't Believe It's Not The Justice League". published in JLA: Classified #4-9. The latter arc was produced before Identity Crisis, but published afterwards. Unfortunately, a running joke in "I Can't Believe It's Not The Justice League" involves the possibility of Sue's pregnancy, and seems somewhat morbid after Identity Crisis.